Activists say they are bringing replicas of the Trump baby blimp stateside. 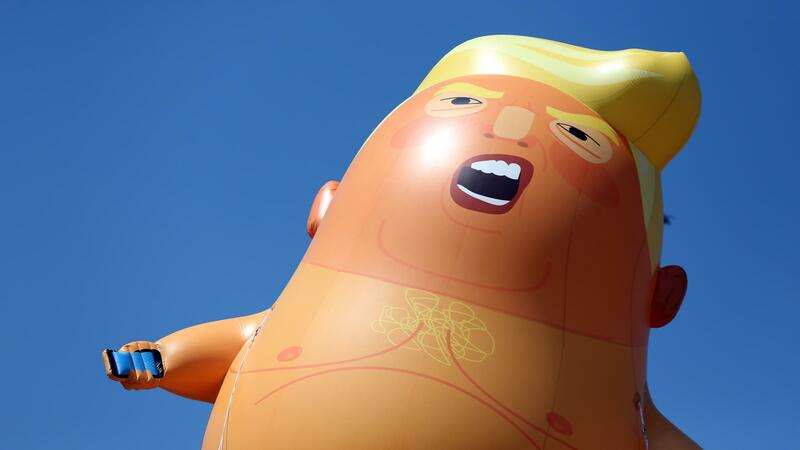 Like any tantruming toddler, the 20-foot-tall baby Trump blimp hovering above Friday's protests in London was difficult to ignore. Now a plan to bring a replica of the yellow-haired, phone-toting, sneering and diapered balloon stateside has garnered so much support that organizers say they will use the funds to buy multiple blimps "so we can go coast-to-coast, border-to-border." New Jersey activists Didier Jiminez-Castro and Jim Girvan said they "were inspired by the patriotic actions of our friends in the UK," so they created a GoFundMe page to see if they could make a similar statement domestically. By Thursday, they had raised $23,693 of their $4,500 aim and closed the page to donations in order "to keep control" of the campaign. They expect the first balloon to be ready by mid-August and they plan to fly it near the president's National Golf Club in Bedminster, N.J.
Girvan, an organizer of The People's Motorcade, told CNN his group holds frequent protests outside the club. "We're comfortable that we're going to have the opportunity to fly the balloon in relatively close proximity to his golf club while he's here," Girvan told the news outlet. Under the social media handle @babytrumptour, Jiminez-Castro and Girvan say the goal is to branch out and "to make Baby Trump available to various locations around the country." They said they are working closely with the creators of the original Trump blimp "to use their design and not a knock off." CNN reports the New Jersey activists have received permission to make their own balloons using the original patterns and molds. The hope is it will elevate their protests in more ways than one. "The baby Trump is not just a piece of humor, but it is also a symbol of the administration," Jiminez-Castro told N.J.com. "It's symbolic of the children that are in cages, it's a symbol of racism, and we know that he hates to be ridiculed." The original blimp flew the same day the actual Trump met with Prime Minister Theresa May at Chequers, about 40 miles outside London, followed by tea with Queen Elizabeth at Windsor Castle. In an interview, he acknowledged he knew about the blimp imitation and was not flattered. "I guess when they put out blimps to make me feel unwelcome, no reason for me to go to London," Trump told British newspaper the Sun. He spent a single night in London during his four-day U.K. trip. Meantime, another apparent opponent of the Trump baby blimp had plans to pop the offending item. Kathie Kitt Conklin of New Jersey started her own GoFundMe page, this one asking for donations, should she be arrested for deflating the balloon and need to be bailed out, reports the Asbury Park Press. "I'm tired of people disrespecting our President! I plan on taking out this ridiculous balloon..." the page stated, before GoFundMe reportedly took it down for violating its terms of service. She reportedly raised $285 toward her $1,000 goal, with donors getting refunds. Reached by phone, the newspaper reports Conklin said, "I don't want to talk to the press. They always twist things. Thanks," then hung up.